The Burger King® brand is firing up the grill in preparation to debut a new commercial during the Super Bowl featuring America’s Favorite Burger®, the Whopper®. The brand is partnering with DoorDash to release a teaser launching on YouTube.com/BurgerKing today that includes the iconic BK® King encouraging fans to get their Mystery Box available exclusively with DoorDash. The teaser film features the Burger King® King as he prepares a set with direction from a director behind the camera. It ends with the King adjusting the mic, ready to announce what is yet to come during the Super Bowl. To get your own Mystery Box head to DoorDash.com or download the DoorDash app, enter promo code MYSTERYBOX on all orders of $10 or more from participating Burger King® restaurants*. Then wait for your Mystery Box to arrive at the comfort of your home with instructions to follow – keep the content of the Mystery Box till game day. And DoorDash will also offer $0 Delivery Fees** when you order Burger King® today through the day after the Big Game. “We haven’t had a commercial air during the Super Bowl in 13 years,” said Fernando Machado, Burger King® Global Chief Marketing Officer. “This limited-edition Mystery Box creates a unique, engaging and innovative experience, and we are excited to launch it nationwide for our customers,” said Christopher Payne, DoorDash Chief Operating Officer. 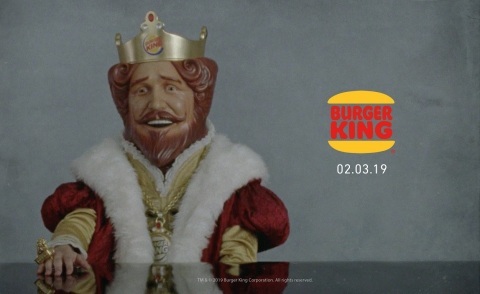 Tune into the Super Bowl to watch the new 45 second commercial from Burger King®restaurants on February 3, 2019. The Whopper® sandwich is a 1/4 lb*** of savory flame-grilled beef topped with juicy tomatoes, fresh lettuce, creamy mayonnaise, ketchup, crunchy pickles, and sliced white onions on a soft sesame seed bun. *Valid through 02/04/19 or while supplies last when you order from participating BURGER KING® restaurants through the DoorDash app or website. $10 order minimum. Limit one per person. Fees, taxes and gratuity apply. See full terms and conditions at: doordash.com/mysterybox and dasherhelp.doordash.com/offer-terms-conditions. **Offer valid through 2/4. Valid only on orders with a minimum subtotal greater than $10. Other fees (including service fee), taxes, and gratuity still apply. See full terms and conditions at dasherhelp.doordash.com/offer-terms-conditions. ***Weight based on pre-cooked patties. Founded in 1954, the Burger King®brand is the second largest fast food hamburger chain in the world. The original Home of The Whopper® the Burger King® system operates more than 17,000 locations in more than 100 countries and U.S. territories. Almost 100 percent of Burger King® restaurants are owned and operated by independent franchisees, many of them family-owned operations that have been in business for decades. To learn more about the Burger King® brand, please visit the Burger King® brand website at www.bk.com or follow us on Facebook, Twitter and Instagram. DoorDash is a technology company that connects customers with their favorite local and national businesses in more than 3,300 cities across the United States and Canada. Founded in the summer of 2013, DoorDash empowers merchants to grow their businesses by offering on-demand delivery, data-driven insights, and better in-store efficiency, providing delightful experiences from door to door. By building the last mile delivery infrastructure for local cities, DoorDash is bringing communities closer, one doorstep at a time. Read more on the DoorDash blog or at www.doordash.com.